The pilgrimage to Makkah for those who are able. “There is none worthy of worship except God and Muhammad is the messenger of God.” This declaration of faith is called the Shahadah, a simple formula that all the faithful pronounce. The significance of this declaration is the belief that the only purpose of life is to serve and obey God, and this is achieved through the teachings and practices of the Last Prophet, Muhammad. Salah is the name for the obligatory prayers that are performed five times a day, and are a direct link between the worshipper and God. 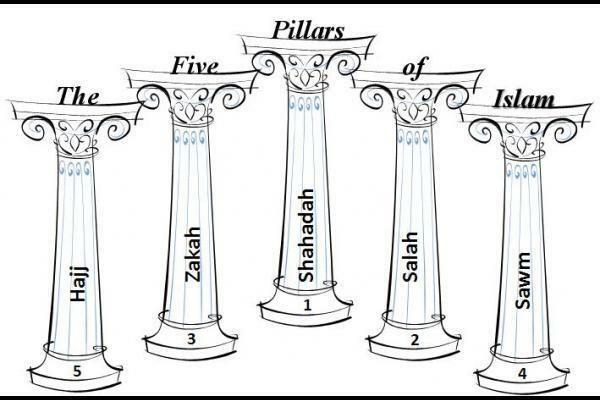 There is no hierarchical authority in Islam and there are no priests. Prayers are led by a learned person who knows the Qur’an and is generally chosen by the congregation. Prayers are said at dawn, mid-day, late-afternoon, sunset and nightfall, and thus determine the rhythm of the entire day. These five prescribed prayers contain verses from the Qur’an, and are said in Arabic, the language of the Revelation. Personal supplications, however, can be offered in one’s own language and at any time. Although it is preferable to worship together in a mosque, a Muslim may pray almost anywhere, such as in fields, offices, factories and universities. Oftentimes visitors to the Muslim world are struck by the centrality of prayers in daily life. God is Great. God is Great. God is Great. God is Great. I testify that there is none worthy of worship except God. I testify that there is none worthy of worship except God. I testify that Muhammad is the messenger of God. I testify that Muhammad is the messenger of God. Come to prayer! Come to prayer! Come to success! Come to success! God is Great! God is Great! There is none worthy of worship except God. Each Muslim calculates his or her own zakah individually. This involves the annual payment of a fortieth of one’s capital, excluding such items as primary residence, car and professional tools. An individual may also give as much as he or she pleases as sadaqa-h, and does so preferably in secret. Although this word can be translated as “voluntary charity” it has a wider meaning. Those who are sick, elderly, or on a journey, and women who are menstruating, pregnant or nursing, are permitted to break the fast and make up an equal number of days later in the year if they are healthy and able. Children begin to fast (and to observe prayers) from puberty, although many start earlier. The pilgrimage to Makkah (the hajj) is an obligation only for those who are physically and financially able to do so. Nevertheless, over two million people go to Makkah each year from every corner of the globe providing a unique opportunity for those of different nations to meet one another. The annual hajj begins in the twelfth month of the Islamic year (which is lunar, not solar, so that hajj and Ramada-n fall sometimes in summer, sometimes in winter). Pilgrims wear special clothes: simple garments that strip away distinctions of class and culture, so that all stand equal before God. The rites of the hajj, which are of Abrahamic origin, include going around the Ka’bah seven times, and going seven times between the hills of Safa and Marwa as did Hagar (Hajir, Abraham’s wife) during her search for water. The pilgrims later stand together on the wide plains of ‘Arafat (a large expanse of desert outside Makkah) and join in prayer for God’s forgiveness, in what is often thought as a preview of the Day of Judgment. The close of the hajj is marked by a festival, the ‘Id al Adha, which is celebrated with prayers and the exchange of gifts in Muslim communities everywhere. This and the ‘Id al Fitr, a festive day celebrating the end of Ramada-n, are the two holidays of the Islamic calendar. Acknowledgement:from the Poster Exhibit of Discover Islam. You can send us a one-time or recurring donation by credit card. After clicking the "Donate" button, you will be taken to our payment provider, PayPal, where you can pay using your Visa, MasterCard, American Express, or Discover credit card. and Amazon will make a donation to ICWC. Please click the below link to get started. Support us and our projects by becoming a sustaining member. Please click the link below to become a member.